SmartCrusher bv has developed a technique for recovering the sand, the gravel and the cement from concrete. Information about this technique is shown and explained in the video. SmartCrusher bv's goal is to reach: Climate neutral circular building in its broadest sense. The SmartCrusher not only makes it possible to create almost climate neutral new concrete from concrete waste. Right now, also the quality and economical aspects (even without calculating the tender benefits and tax advantages) of the SmartCrusher technologies are definitely advantageous. In addition to the existing SmartCrusher (crushing/milling) technology, additional technologies are under development that will make concrete completely 100% circular. Read more about Concrete and the Environment. SmartCrusher as the solution, read why. 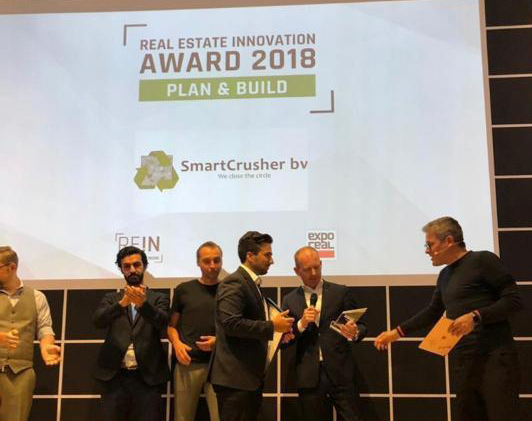 Published on February, 22nd 2019• In a competition with more than 120 registrations and extensive jury meetings, SmartCrusher has been chosen as -for the second time in a row- the winner in the Construction category. The competition between Construction, Consumption Goods, Plastics, Biomass & Food and Manufacturing Industry has been won by Auping mattresses. 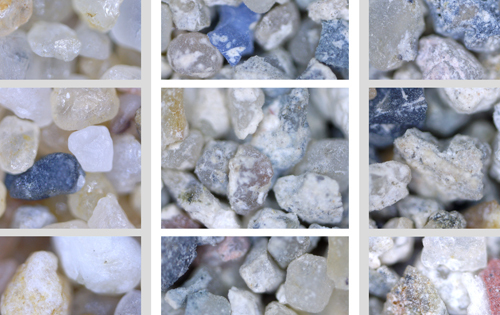 Published on January, 23rd 2019• In this comparator new concrete sand, sand from the SmartCrusher and traditional breaker sand are compared. You can view and compare the various photos yourself. Grains with a size ranging from 0.5mm to 0.039mm can be compared. Published on December, 3rd 2018• Do you want to contribute to a better environment with SmartCrusher and also make a good investment? Using the calculation model below you can determine what an investment means. 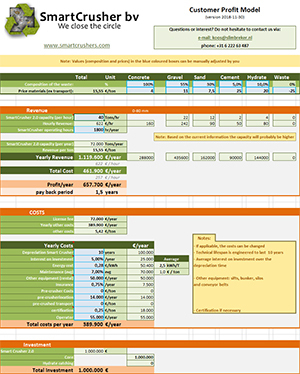 You can use the calculation model to enter and adjust your required data to generate an overview of the revenue. Note: The advice is to open the spreadsheet on your computer for the ease of editing the data because of the protected elements in the spreadsheet. Interested in opportunities or questions? Please contact us via Koos Schenk via koos@slimbreker.nl or call +31 6 222 63 487. 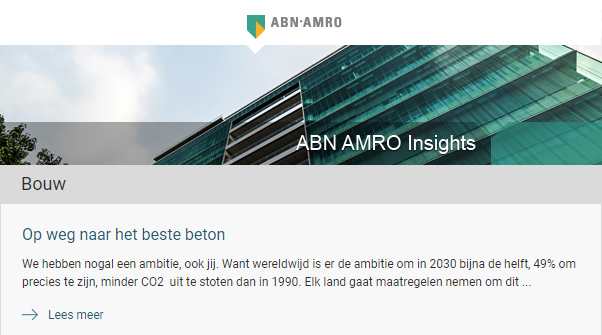 Published on December, 7th 2018• In the last newsletter of ABN-AMRO an article has been published about the Concrete Agreement. An agreement that, according to the Dutch Prime Minister Rutte, 'is an example for other sectors'. We can certainly be proud as a sector that we have put together this first paper step in the concrete. On the way to the next concrete steps. 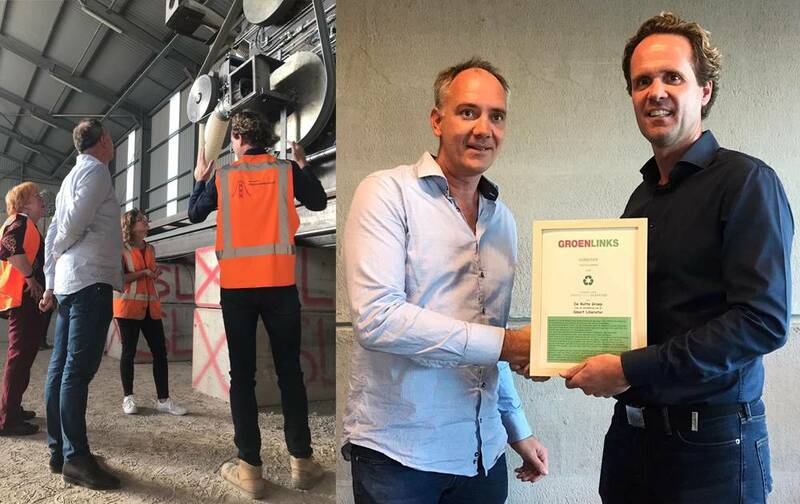 Published on November, 5th 2018• On the occasion of the Day of Sustainability, GroenLinks Zaanstad awarded the Sustainability Award to the Rutte Group yesterday, Wednesday 10 October. It is for the ninth time that GroenLinks handed out the prize. The prize was awarded because of the Smart Liberator. A machine with which old concrete can be reused and which is still on the company premises in Amsterdam. If this innovative technology is applied globally, this can result in a 9% CO2 reduction, according to the Rutte Groep. Three of these machines eventually arrive at Zaandam. They are powered by energy that comes from solar panels. The production process therefore also takes place in a sustainable manner. 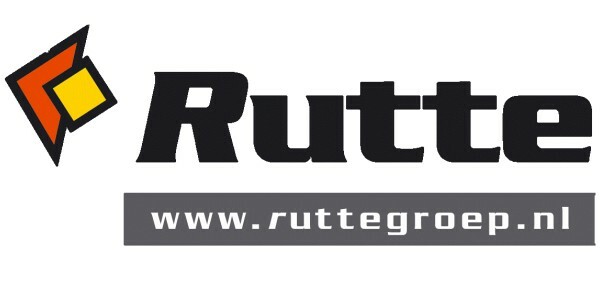 At the moment, the Rutte Group is still located in Amsterdam Westpoort. The company has acquired a site in the Achtersluispolder. "Cross beacon will be the location for the Smart Liberator within one to two years", according to Cornelis Wals of the Rutte Groep. "You better!" GroenLinks party chairman Paul Laport joked, "otherwise you will have to hand in this Zaanse Sustainability Prize again." See also ROTI for a (Dutch) article about this sustainability prize for Rutte Groep. 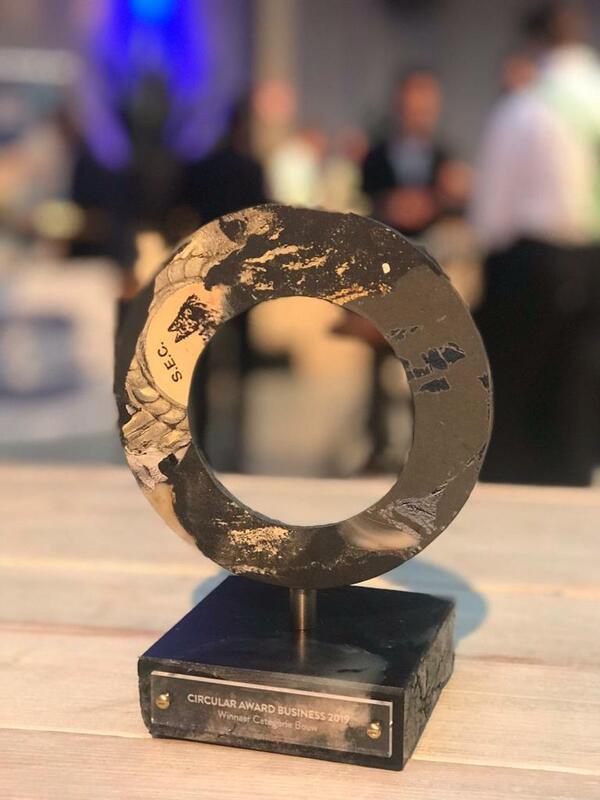 Published on October, 10th 2018• In a competition with 700 start-ups from all over Europe Michel Baars from our partner New Horizon Urban Mining on behalf ofRutte Groep and SmartCrusher was allowed to pitch and won. Both the public and the professional jury made it very exciting during the EXPO REAL (Messe Munchen). Published on October, 5th 2018• Re-cementing pure cement hydrates from the SmartCrusher is mainly a matter of heating, and thus a matter of energy. Chemically speaking, hardly anything has changed over the years. From pure cement hydrates this can be done with 30% to 50% less energy compared to CaCO3 (Marl) and with at least 80 less CO2 in existing cement kilns. In the case of fully electrical processing, for example in a number of Microwave furnaces, this can amount to almost CO2 free new cement! 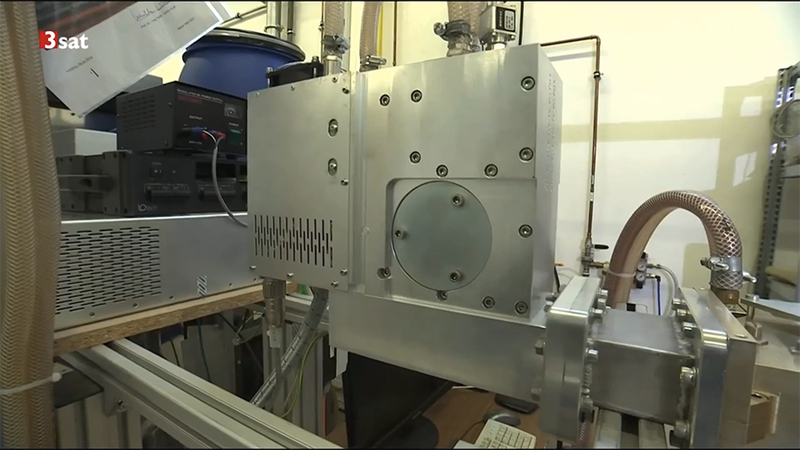 Several Microwave ovens then also form a Gridleveler to match supply and demand of wind and solar energy. Published on September, 4th 2018• A section of technical masterpieces from Dutch companies in the Dutch KIJK Magazine. This month in NederTech the Smart Liberator. SmartCrusher bv signs the agreement on concrete. Published on August, 4th 2018• SmartCrusher bv was, as a participant of the very first hour, actively involved in both the table "CO2" and at the table "Recycling". Although SmartCrusher wanted to go further in the objectives, the result can be seen as a good start. Magazines, scientific articles, research reports and news reports about SmartCrusher appear on a regular basis. Concrete to high-quality concrete. In this project, an installation is being built in the border region to process concrete debris into the original cement, sand and gravel components (SmartCrusher technology). The hydrated cement is regenerated in a microwave oven. This way, new high quality concrete can be made from concrete rubble. Fiber-reinforced concrete will also be developed to limit material consumption. The deployment of the SmartCrusher. SmartCrusher has found a solid partner in the Rutte Group. An excellent cooperation with the Rutte Group and New Horizon Urban Mining for the deployment of the SmartCrusher. The SmartCrusher is used for all the concrete released during the dismantling of buildings within New Horizon projects. SmartCrusher BV is an active partner of CSR Netherlands. As a partner we are striving towards corporate social responsibility. It is our belief that together we can make a difference. See the website CSR Netherlands for our CSR ambitions and our progress.